1.) Dominant Trend: During World War II, restrictions on shipping and strict port security produced a marked hiatus in global opium trafficking. Denied illicit opiates from Asia, the United States drew limited supplies of low-grade heroin from Mexico that failed to meet even a fraction of consumer demand. By the end of the war, the US addict population had dropped to an historic low of some twenty thousand. Once smuggling resumed after the war, however, the US addict population resumed the habit. 1200-800 B.C. Cannabis is mentioned in the Hindu sacred text Atharvaveda (Science of Charms) as "Sacred Grass", one of the five sacred plants of India. It is used by medicinally and ritually as an offering to Shiva. 700-300 B.C. Scythian tribes leave Cannabis seeds as offerings in royal tombs. 500-100 B.C. Hemp spreads throughout northern Europe. 100 B.C.-0 The psychotropic properties of Cannabis are mentioned in the newly compiled herbal Pen Ts'ao Ching which is attributed to an emperor c. 2700 B.C. 0-100 A.D. Construction of Samartian gold and glass paste stash box for storing hashish, coriander, or salt, buried in Siberian tomb. 70 A.D. Dioscorides mentions the use of Cannabis as a Roman medicament. 170 A.D. Galen (Roman) alludes to the psychoactivity of Cannabis seed confections. 900-1000 A.D. Scholars debate the pros and cons of eating hashish. Use spreads throughout Arabia. Early 1200s Hashish smoking very popular throughout the Middle East. 1155-1221 Persian legend of the Sufi master Sheik Haidar's of Khorasan's personal discovery of Cannabis and it's subsequent spread to Iraq, Bahrain, Egypt and Syria. Another of the ealiest written narratives of the use of Cannabis as an inebriant. 1300s The oldest monograph on hashish, Zahr al-'arish fi tahrim al-hashish, was written. It has since been lost. 1300s Ibn al-Baytar of Spain provides a description of psychaoctive Cannabis. 1300s Arab traders bring Cannabis to the Mozambique coast of Africa. 1271-1295 Journeys of Marco Polo in which he gives second-hand reports of the story of Hasan ibn al-Sabbah and his "assassins" using hashish. First time reports of Cannabis have been brought to the attention of Europe. mid 1600s The epic poem, Benk u Bode, by the poet Mohammed Ebn Soleiman Foruli of Baghdad, deals allegorically with a dialectical battle between wine and hashish. Late 1700s Hashish becomes a major trade item between Central Asia and South Asia. 1900s Hashish production expands from Russian Turkestan into Yarkand in Chinese Turkestan. 1809 Antoine Sylvestre de Sacy, a leading Arabist, reveals the etymology of the words "assassin" and "hashishin"
1843 Le Club des Hachichins, or Hashish Eater's Club, established in Paris. 1893-1894 The India Hemp Drugs Commission Report is issued. 1893-1894 70,000 to 80,000 kg of hashish legally imported into India from Central Asia each year. Early 2000s Hashish smoking very popular throughout the Middle East. 1915-1927 Cannabis begins to be prohibited for nonmedical use in the U.S., especially in SW states...California (1915), Texas (1919), Louisiana (1924), and New York (1927). 1920s-1930s High-quality hashish produced in Turkey near Greek border. 1934-1935 Chinese government moves to end all Cannabis cultivation in Yarkand and charas traffic from Yarkand. Both licit and illicit hashish production become illegal in Chinese Turkestan. 1941-1942 Hand-rubbed charas from Nepal is choicest hashish in India during World War II. Late 1960s-Early 1970s The Brotherhood popularizes Afghani hashish. Oct 27, 1970 The Comprehensive Drug Abuse Prevention and Control Act is passed. Part II of this is the Controlled Substance Act (CSA) which defines a scheduling system for drugs and places most of the known hallucinogens (LSD, psilocybin, psilocin, mescaline, peyote, cannabis) in Schedule I. 1976-1977 Quality of Lebanese hashish reaches zenith. Late 1970s Increasing manufacture of "modern" Afghani hashish. Cannabis varieties from Afghanistan imported into Kashmir for sieved hashish production. 1980s "Border" hashish produced in northwestern Pakistan along the Afghan border to avoid Soviet-Afghan war. 1988 DEA administrative law Judge Francis Young finds after thorough hearings that marijuana has clearly established medical use and should be reclassified as a prescriptive drug. First synthesized in 1887 Germany, amphetamine was for a long time, a drug in search of a disease. Nothing was done with the drug, from its discovery (synthesis) until the late 1920's, when it was seriously investigated as a cure or treatement against nearly everything from depression to decongestion. In the 1930's, amphetamine was marketed as Benzedrine in an over-the-counter inhaler to treat nasal congestion (for asthmatics, hay fever sufferers, and people with colds). A probable direct reaction to the Depression and Prohibition, the drug was used and abused by non-asthmatics looking for a buzz. By 1937 amphetamine was available by prescription in tablet form. Methamphetamine, more potent and easy to make, was discovered in Japan in 1919. The crystalline powder was soluble in water, making it a perfect candidate for injection. It is still legally produced in the U.S., sold under the trade name Desoxyn. During World War II, amphetamines were widely used to keep the fighting men going (during the Viet Nam war, American soldiers used more amphetamines than the rest of the world did during WWII). In Japan, intravenous methamphetamine abuse reached epidemic proportions immediately after World War II, when supplies stored for military use became available to the public. In the United States in the 1950s, legally manufactured tablets of both dextroamphetamine (Dexedrine) and methamphetamine (Methedrine) became readily available and were used non medically by college students, truck drivers, and athletes, As use of amphetamines spread, so did their abuse. Amphetamines became a cure-all for such things as weight control to treating mild depression. This pattern changed drastically in the 1960s with the increased availability of injectable methamphetamine. The 1970 Controlled Substances Act severely restricted the legal production of injectable methamphetamine, causing its use to decrease greatly. Methamphetamine trafficking and abuse in the United States have been on the rise over the past few years, as indicated by investigative, seizure, price, purity, and abuse data (see "trends" below). As a result, this drug is having a devastating impact in many communities across the nation. Although more common in western areas of the country, this impact increasingly is being felt in areas not previously familiar with the harmful effects of this powerful stimulant. Clandestine production accounts for almost all of the methamphetamine trafficked and abused in the United States. The illicit manufacture of methamphetamine can be accomplished in a variety of ways, but is produced most commonly using the ephedrine/pseudoephedrine reduction method. Large-scale production of methamphetamine using this method is dependent on ready access to bulk quantities of ephedrine and pseudoephedrine. During the past two years, several bulk ephedrine seizures destined for Mexico focused attention on the magnitude of ephedrine acquisition by organized crime drug groups operating from Mexico and in the United States, and set in motion an effort to focus international attention on the ephedrine diversion problem and to take action to prevent such diversion. Drug law enforcement efforts against clandestine methamphetamine producers constitute a "cat and mouse" game between efforts to cut off chemical supplies and efforts to obtain them from non-regulated sources. Past experience has demonstrated that methamphetamine traffickers are relentless, flexible, and creative in finding new ways to obtain chemicals by evading the network of international controls that has been established. The Federal Government currently is preparing regulations to further reduce the diversion of pharmaceutical products containing chemicals, such as ephedrine and pseudoephedrine, that can be used to produce illegal drugs. It has consulted with corporations within the pharmaceutical industry to develop a solution to the diversion problem that does not unduly restrict the availability of these chemicals for legitimate use. Domestically, large-scale production of methamphetamine is centered in California. In addition, methamphetamine increasingly is produced in Mexico and smuggled into the United States. Methamphetamine laboratory operators often are well-armed, and their laboratories occasionally are booby-trapped and equipped with scanning devices employed as security precautions. Weaponry, ranging from single firearms to arsenals of high-powered weapons and explosives, are commonly found at laboratory sites. Not only are methamphetamine laboratories used to manufacture illegal, often deadly drugs, but the clandestine nature of the manufacturing process and the presence of ignitable, corrosive, reactive, and toxic chemicals at the sites have resulted in explosions, fires, toxic fumes, and irreparable damage to human health and to the environment. Traditionally, the suppliers of methamphetamine throughout the United States have been outlaw motorcycle gangs and numerous other independent trafficking groups. Although these groups continue to produce and distribute methamphetamine, organized crime drug groups operating from Mexico currently dominate wholesale methamphetamine trafficking in the United States for several reasons: these organizations established access to wholesale ephedrine sources of supply on the international market; these organizations are producing unprecedented quantities of high-purity methamphetamine on a regular basis; and, they already control well-established cocaine, heroin, and marijuana distribution networks throughout the western United States, enabling them to supply methamphetamine to a large retail level market. Their expansion into the methamphetamine trade has added a new dimension to their role in the U.S. drug market and has redefined the methamphetamine problem in the United States. Presently, these organizations are poised to supply methamphetamine to the rest of the country in response to any increases in demand. 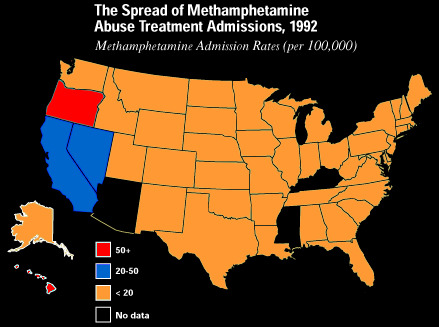 As we begin 1997, the West, Southwest, and the South there are reports of methamphetamine and ephedrine as emerging drugs. According to DEA sources, Mexican manufacturers and distributors have replaced the outlaw motorcycle groups which had produced methamphetamine supplies for over twenty years. The new manufacturers are producing large quantities of high purity methamphetamine on both sides of the border, drawing on the legal supply of the precursor chemicals on the Mexican side. The price of methamphetamine had dropped significantly (to approximately $3000/pound in Southern California) until recent efforts to curtail ephedrine/pseudoephedrine supplies produced a slight shortage in some areas and a corresponding price increase. In Washington State, sources report that the resultant price increase has caused a number of methamphetamine users in that area to switch to cocaine. Use among youth. The 1998 MTF survey asked 12th graders about the use of crystal methamphetamine known as "ice" -- which is smoked or burned in rock form. The survey found that lifetime ice use -- which had leveled-off at 4.4 percent in 1997 after a four-year rise -- rose in 1998 to 5.7 percent. The perceived harmfulness of methamphetamine among youth has also declined steadily since 1992 -- when 61.9 percent of 12th graders perceived "great risk" in trying "ice" once or twice -- to 1998, when only 52.7 percent perceived great risk. Availability. Methamphetamine is by far the most prevalent synthetic controlled substance clandestinely manufactured in the United States. In the West and Southwest, it is increasingly significant as a drug of abuse: 52 percent of all those arrested in San Jose for drug possession, for example, test positive for methamphetamine. The Midwest has also seen an increase in methamphetamine production, trafficking and consequences. 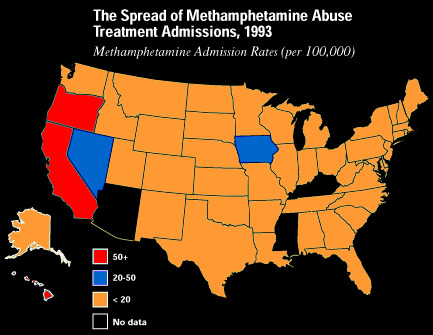 While the drug is not commonly found in the East and Southeast an analysis of methamphetamine treatment admissions as well as increased seizures suggest that the use of the drug maybe spreading eastward. The number of methamphetamine laboratory seizures reported to the Drug Enforcement Administration (DEA) in 1997 increased dramatically, to 1,431 from 879 in 1996. This reflects the widespread proliferation in the manufacture, trafficking, and use of the drug across the West and Midwest and portions of the South. During 1997 methamphetamine prices nationwide ranged from $3,500 to $30,000 per pound, $400 to $2,800 per ounce, and 37 dollars to $200 per gram. Responses to opiate use vary across the world and are, in many ways, as much a product of history as of anything else. Understanding the history of responses to opiate use puts into context the prescribing policies we see today - and may help us anticipate the future. Starting with the first organised responses to opiate use in the UK this section describes the influences on policy and practice, including those from the USA, the history of the discovery of methadone and the development of its unique role in the treatment of opiate use. The services offering a treatment response to opiate use that are currently available in the UK are then described in the light of the historical background. At the turn of the century most countries had few laws restricting the possession of drugs. In July 1916, following rumours that soldiers on leave were using cocaine, a 'Defence of the Realm Regulation' was enacted making it illegal to possess cocaine unless prescribed by a doctor. In 1920 and 1923 the list of drugs that were illegal to possess, import or sell was expanded by the Dangerous Drugs Acts to include opium and opium derivatives such as heroin. Doctors could still prescribe these drugs, but each prescription could only be for a maximum of three collections from the pharmacy. This caused some concern among doctors because it left them unclear as to when prescribing these drugs was legitimate and was seen as Home Office interference with medical autonomy. In 1924 the Ministry of Health set up a committee, chaired by Sir Humphrey Rolleston, to look into these issues. This report, published in 1926, accepted the principle that all doctors could legitimately prescribe addictive drugs as part of the treatment of dependence. The report argued that abstinence should be the long-term goal of treatment, but also accepted that long-term prescribing was a legitimate way of treating people who were unable to stop taking drugs. complete withdrawal produces such serious symptoms which cannot be satisfactorily treated under the normal conditions of private practice; or the patient, while capable of leading a normal life so long as he takes a certain non-progressive quantity, usually small, of the drug of addiction, ceases to be able to do so when the regular allowance is withdrawn. This pragmatic approach in which the care of opiate users was entrusted to doctors continued without serious review until the late 1950s. However the number of people being treated at any time was only a few hundred - and they were generally considered to be stable. In 1939 Otto Eisleb and a colleague O Schaumann, scientists working for the large chemicals conglomerate I G Farbenindustrie at Hoechst-Am-Main, Germany, discovered an effective opioid analgesic drug which they numbered compound 8909 and called Dolantin.3 This was the discovery of pethidine. As with diamorphine (heroin) before, and buprenorphine (Temgesic) since, the early hopes of it being 'a new non-addictive analgesic' were not realised. Effective analgesics that were structurally dissimilar to morphine - in the hope that they would be non-addictive5 and escape the strict controls on opiates. There is no evidence, as had been widely believed both here and in the USA, that they were working as part of a German attempt, directed by Hitler, to replace opium supplies which had been cut off by the war. During 1937 and the spring and summer of 1938 Bockm�hl and Ehrhart worked on the creation of another new substance in the group which they called 'Hoechst 10820' and, later, polamidon. An explanation for it not being exploited more fully between 1939 and 1945 was given by Dr K K Chen - an American doctor who did much of the early clinical research work after the war - who said a former employee of I G Farbenindustrie had told him in personal correspondence that they had discounted its use because of the side effects.8 Chen presumed that the doses used in the experiments had been too high, causing nausea, overdose etc. All German patents and trade names, including those for polamidon, were requisitioned by the allies as spoils of war. The I G Farbenindustrie factory was in a US occupation zone and therefore came under American management. The US Foreign Economic Management Department sent a 'Technical Industrial Intelligence Committee' team of 4 men (Kleiderer, Rice, Conquest and Williams) to investigate the war-time work at Hoechst. The formula was distributed around the world and exploited by many companies, which is why it has so many different trade names. As a result this production of analgesics, which was no longer commercially viable, practically stopped at Hoechst after the war. The pethidine plant, by then half finished, was instead dedicated to the production of penicillin.4 The I G Farbenindustrie empire was broken up by the allies and the plant that had developed methadone became part of a new company called Hoechst A G.
Eli-Lilly and other American and UK pharmaceutical companies quickly began clinical trials and commercial production of the new drug, polamidon. The earliest accounts of methadone use in the UK were from papers published in the Lancet in 1947 describing it as 'at least as powerful as morphine, and 10 times more powerful than pethidine' and, subsequently, a study of its use as an obstetric analgesic at the University College, London.12 This study, however, was terminated because of respiratory depression in the newborn babies. Early advertisements claimed that Physeptone (Wellcome's trade name for methadone) carried 'little risk of addiction' and the consensus was that it was a better analgesic than morphine. It is therefore likely that the first people who became dependent on it had either been treated for pain or treated by doctors who thought it to be less dependency-forming than other opiates. In 1958, at the instigation of the Home Office, the Department of Health set up a Committee on Drug Addiction to review policy in the light of the new synthetic opiates that had come on to the market. The report, often called the 'First Brain Report', was published in 1961. Its conclusions were, effectively, an endorsement of the Rolleston report. In the early 1960s the number of opiate addicts increased and the pattern of use began to change: there were younger people and more people taking opiates for pleasure rather than as part of medical treatment. Heroin first overtook morphine as the most notified drug of addiction in 1962.15 Most of these 'new' addicts lived in London. All of the heroin was pharmaceutically pure and much of it was prescribed by a small number of doctors. There was concern that, contrary to the principles of the Rolleston report, some doctors were showing little, if any, inclination to 'make every effort for the cure of addiction'. This concern led to the recall of the Committee on Drug Addiction in 1964. Drug clinics were set up to provide specialised medical treatment of addiction. Contrary to the belief of many doctors methadone has never been one of the controlled drugs that can only be prescribed by specially licensed doctors. Help people get off drugs altogether. In the first years of the drug clinics they prescribed drugs that the clients were already taking, mostly in injectable form. Some clinics had 'fixing rooms' where injecting equipment was provided so that clients could inject their medication. As a 'freebie' to encourage bulk sales of the 10mg diamorphine tablets. These supplies came from both the clinics and a small number of doctors in central London who had large numbers of opiate users on their lists to whom they prescribed freely. During the 1970s the incidence of heroin use continued to rise. For the first time this included a significant quantity of imported, illicit heroin. The clinics started to doubt the efficacy of prescribing the client's drug of choice as a way of producing change. Clinic prescribing practice moved away from predominantly prescribing injectable heroin towards prescribing oral methadone, on the basis that it was more therapeutic to prescribe a non-injectable drug and because its long half-life meant it could be taken once daily rather than every few hours. As the results of this study became available the clinics were starting to deal with a new and different client group: large numbers of working-class heroin users who were smoking rather than injecting the relatively cheap heroin that had appeared on the market from the Middle East. In the light of the changing client group - who were not asking for injectable drugs - and the results of the study, the clinics defined their role as one of promoting change and increasingly moved towards the use of oral methadone. Some clinics began to review the efficacy of maintenance prescribing. For example a small study carried out in 1975 by the Glasgow Drug Clinic found that ceasing to prescribe methadone to new patients led to them improving as much as maintained patients, except in the area of crime.17 Although weak scientifically, the publication of studies such as this in the late 1970s led to questioning of the value of maintenance prescribing, or, indeed, any prescribing. This great increase in the early 1980s differed from that of 20 years earlier, in that it was not restricted to London: it occurred all over Britain and many of these new users smoked their heroin (known as 'chasing the dragon') rather than injecting it. The prescribing response was largely one of methadone mixture detoxification programmes - the 'gradual withdrawal method' of the Rolleston report. However the increase in the number of opiate users meant that services had to expand and become more widely available. Prompted by this change and the Advisory Council on the Misuse of Drugs (ACMD) Report on Treatment and Rehabilitation19 the Government responded with a funding initiative which saw the development of a non-statutory drug service and/or a Community Drug Team in most health districts. Most of these new services got involved in methadone prescribing either by employing a clinical assistant or a consultant psychiatrist on a sessional basis to prescribe methadone, or through working with GPs. The possibility of rapid transmission of the HIV virus among intravenous drug users and reports of high HIV prevalence figures among intravenous drug users in Edinburgh prompted a fundamental review of drugs policy. The 1988 report of the Advisory Council on the Misuse of Drugs (ACMD) on AIDS and drug misuse20 Part 1 led to the development of community-based needle and syringe exchange schemes all over Britain. Taking prescribed rather than illegal drugs. This reversed the abstinence-orientated prescribing policy of the preceding years as it legitimised longer-term prescribing to enable users to stop injecting. Although there was a wider range of prescribing options supplementing short-term detoxification, most doctors continued to prescribe methadone mixture only for limited periods of time. In time it transpired that the high HIV infection rates in Edinburgh were a local phenomenon resulting from factors such as unavailability of injecting equipment, and were not being replicated across Britain.21, 22 However the services that were set up on the assumption that these HIV prevalence rates were typical have almost certainly been instrumental in maintaining relatively low rates of HIV seroprevelance among injecting drug users. In Merseyside some doctors revived the prescribing of heroin in injectable and smokeable forms. Much of the research into methadone treatment has been carried out in the USA. The American experience shows that treating patients with the same medication can be viewed and executed in very different ways, and that these may be as important as the drug itself in determining the effects of treatment. From the First World War onwards American and British drug policies took very different directions. In the USA in 1914 the Harrison Act controlled the sale and possession of drugs. It contained references to the prescription of addictive drugs for 'legitimate medical purposes ... prescribed in good faith'. However in 1922 the Behrman case, in stark contrast to UK policy, determined that it was a crime for a physician to prescribe a narcotic drug to an addict. By 1938 approximately 25000 doctors had been prosecuted on narcotics charges and 3000 had served prison sentences! Federal agents relied heavily on the testimony of drug users to secure these convictions - they secured these testimonies by supplying the users with small quantities of drugs.6 Understandably this resulted in doctors having very little to do with the treatment of addiction. After the Second World War there were just two large drug treatment facilities providing in-patient treatment to 'help addicts abandon drug taking'. The one at Fort Worth in Texas offered a service to men who lived west of the Mississippi and the one in Lexington in Kentucky served men east of the Mississippi and women from the entire USA. In the early 1960s Dr Marie Nyswander and Dr Vincent Dole, a respected American psychiatrist and research scientist, had found that they could not stabilise opiate users on morphine without continually increasing the dose. They reviewed the medical literature in search of possible alternatives and pioneered the radical step of prescribing methadone which was effective orally, and seemed from pain research and some detoxification experience to be longer acting (they were not able to measure blood levels in those days). They soon found that once they had reached an adequate treatment dose that they could maintain people on that dose for long periods of time. Dole encountered powerful resistance from the US Bureau of Narcotics whose agents told him that he was breaking the law and that they would 'put him out of business'. In view of the past history of doctors' experiences in court he took the brave step of inviting them to prosecute so that a 'proper ruling on the matter could be made' - they declined. Within a year Nyswander and Dole had developed 'Methadone Maintenance Treatment'. Their experiments with this approach began with treating people in a locked ward with elaborate security procedures. The project soon discovered that this level of security was unnecessary and it was gradually abandoned by moving first to an open ward, and then having patients reside in the ward whilst they went out in the daytime to work. This innovative treatment was offered only to people with a long history of heroin use and failed treatment. Nyswander and Dole based their approach on the theory that, once addicted, opiate addicts suffer from a metabolic disorder, similar in principle to metabolic disorders such as diabetes. Just as insulin normalises the dysfunction in diabetes, so methadone was proposed to normalise the dysfunction of opiate addiction. They argued the necessity for large doses of methadone (80mg to 150mg) to establish a 'pharmacological blockade' against the effects of heroin, that would prevent addicts from experiencing euphoria if they took it. This new form of treatment spread rapidly in the USA but was often implemented in a rigid way that lost some of the characteristics of Nyswander and Dole's original work. Consequently few programmes have produced such good results as their early work. The ways in which it was implemented in the early 1970s were strongly affected by political and other factors, with extensive government regulation. The medical treatment was - and is - encased in a rigid delivery system. In most programmes patients attend the programme daily to drink their methadone and are regularly monitored through testing of urine samples (the collection of which is supervised) and counselling. Some programmes offer a variety of help and psycho-social treatment from group therapy to help in finding jobs. Once patients are stabilised they are able to earn the 'privilege' of taking home doses of methadone for one or more days. The numbers of patients receiving Methadone Maintenance Treatment (MMT) in the USA rose: in 1992 there were about 120000 patients served by around 800 programmes. There is a great deal of variation in the rehabilitation and psycho-social services that are offered in addition to methadone and also in the dosage levels employed. Over half of patients receive below 60mg daily - which is accepted in the USA as the therapeutic minimum28 - well below the level recommended by Nyswander and Dole's research. Everyone has the right to have a GP. Although many refuse to treat drug dependency all GPs are entitled to prescribe methadone (and most other drugs) in order to treat addiction. GPs notify nearly half of all those treated with methadone. They do not usually have in-house testing facilities such as urinalysis, but primary health care teams increasingly have staff such as counsellors in their surgery. GPs vary considerably in their attitudes and practice in treating drug problems. If a GP is not inclined to prescribe methadone for an opiate user there is little that can be done to force them because doctors are able to use considerable discretion in deciding what they think is the best treatment for their patients. Such services are often called the 'Drug Advisory Service' or similar and tend to be based in town centres, designed to be easily accessible and easy to approach. They may be staffed by a mix of paid staff and voluntary workers, usually providing a telephone helpline, advice and counselling, needle exchange and guidance on how to access residential rehabilitation and detoxification or methadone treatment. They usually serve a wide range of people with drug problems, and their families. Statutory services are usually staffed by nurses and social workers and in some cases also by clinical psychologists, probation officers, counsellors, and/or medical practitioners. Some community drug teams play the same role as street agencies, but usually focus on a prescribing and counselling service. They may have their own doctor to prescribe, or may liaise with the patient's GP to put together a package of care involving monitoring and counselling from the CDT. CDTs tend to serve mainly opiate users, but usually have a remit to help people and their relatives with other types of drug problems. Drug clinics tend to be based in hospital and emphasise out-patient medical care; they are often headed by a consultant psychiatrist, but staffed by doctors, nurses, social workers, and possibly occupational therapists and/or clinical psychologists. Clients may have to attend on a daily basis or several times a week to obtain their prescriptions. In some cases, usually 'low threshold methadone maintenance programmes', they may be required to drink their methadone at the clinic in front of a member of staff. To cope with the large volume of prescription writing most clinics use a computer to generate prescriptions - see Section 5: methadone and the law, handwriting exemptions. These prescriptions may then be sent to retail pharmacies for dispensing. Alternatively, methadone may be dispensed from a local hospital pharmacy as this is often cheaper. Drug clinics may have access to specialist in-patient facilities for detoxification and other in-patient treatments. Some clinics have facilities for dispensing methadone to patients who have to attend daily to receive their medication. Drug clinics usually offer a variety of treatment options. Large centre prescribing is often an essential part of a service to a large number of opiate users, hence their predominance in large cities. Despite the experience of Dr Anne Dally (see above) there are still a small number of doctors in private practice who prescribe oral or injectable methadone to drug users. Some do it out of a belief in the need for more sympathetic, responsive services and offer a useful adjunct to the NHS. Others are not so principled, and some of these are still a source of drugs for the illicit market, and are of little therapeutic value to their patients. However, large dose, unsupervised prescribing is not confined to private practice and is a feature of a minority of all service types. In general, private services are preferred by clients who are in full-time employment, and appreciate the shorter waiting times, increased doses and willingness to prescribe on a maintenance basis. 1708 Coca is first mentioned in a materia medica, Institutiones Medicae, written by German physician and botanist Herman Boerhaave. 1855 Cocaine first extracted from Coca leaves.